Clay is a wonderful medium to create extremely natural looking and humanistic sculptures. 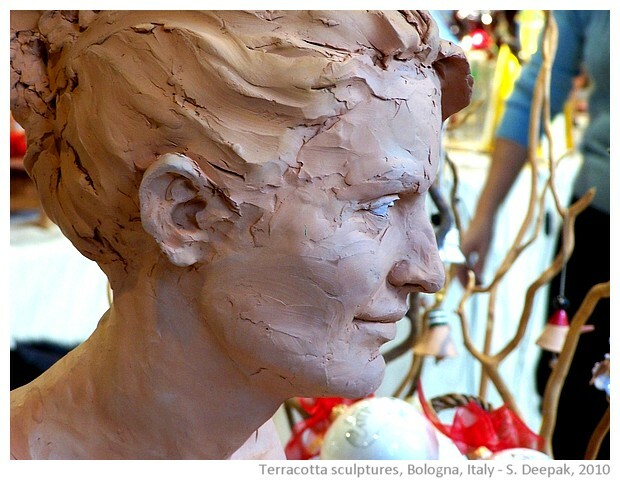 The art of baking clay to create terracotta sculptures goes back to prehistoric times. My first introduction to terracotta art was in Xian in China, when I had visited the famous two thousand years old, buried terracotta army. This art of making terracotta continues to be alive and significant even today. (Image left: a medieval terracotta on the façade of a small church in Bologna). In this article, I focus on development of terracotta sculptures in Emilia part of Emilia-Romagna region of northern Italy (shown in the map below in yellow colour) , especially in the regional capital city of Bologna (BO), over the past nine hundred years. The practice of making terracotta sculptures goes back to prehistoric times. Prehistoric terracotta female figurines were uncovered by archaeologists in areas of Europe around Black sea. Similar female figurines and phallus like objects were found in excavations of Mohenjo-daro (3000-1500 BC) in what is now Pakistan. The army of terracotta soldiers buried in the tomb of emperor Qin in Xi'an (China) is from 210 BC. The word "terracotta" comes from Italian and means "earth baked" and is used for clay-based unglazed or glazed ceramic. Emilia region in northern Italy has a well developed tradition of making terracotta sculptures that goes back to the early Gothic period, that is, from around 1200 AD. Roman empire took inspiration from the earlier Greek traditions and created a Roman style of arts and architecture. In terms of sculptures, the Roman period saw the creation of monumental sculptures made of stone. Around 500 AD, with the decline of Roman empire, different parts of the empire developed their own art and architecture styles. Thus Carolingian style developed in 8th and 9th centuries, followed by Ottonian style in 9th and 10th century Germany and by Romanesque style in the 11th century. In these pre-Romanesque and Romanesque periods, separate individual sculptures were not very common. The sculptures usually appeared as part of capitals of the columns or as bass-relief on the walls, especially above the doors. These sculptures were made in a stylized forms, such as those inspired from Byzantine icons and represented idealised notions of beauty rather than attempting a faithful representation of the reality. Early Gothic style in 12th century finally saw greater attention towards sculptures, that developed from bass-relief to a gradual separation from the walls. By 14th and 15th century, individual sculptures, both religious and secular, appeared in different parts of Italy. Another important change in this period was the shift from the stylized forms of sculptures based on ideals of classical beauty to more natural looking sculptures that resembled actual persons. This transition became complete during the renaissance period. While in the big cities of medieval Italy, like Naples, Rome and Florence, the sculptures were made from stones such as marble, in the Emilia region to the north of Florence, marble was not easy to find, while different kinds of clay was abundant and was thus used frequently in the urban architecture. 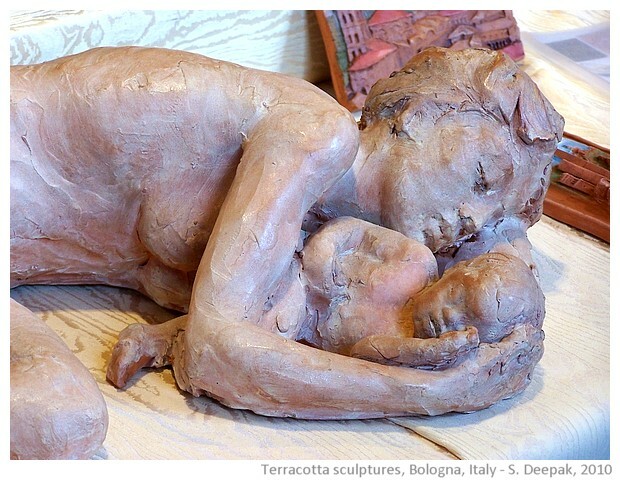 For this reason, the traditions of terracotta sculptures took roots in different parts of Emilia. Valeria Massano, a teacher of history of art explains that depending upon the composition of the clay, after firing, the dried terracotta statues change colours. Thus, in Emilia there was a tradition of covering the terracotta statues with some paint such as a marble coloured paint. From bass-relief to individual sculptures, terracotta allowed Emilian sculptors to create art work of great originality and expressivity. Niccolò dell'Arca (1435-1494), Guido Mazzoni (1450-1518), Alfonzo Lombardi (1497-1537), Antonio Begarelli (1499-1565) and Cesare Tiazzi (1743-1809) are some of the better known artists who worked with terracotta sculptures in Emilia region. Evolution of terracotta sculptures in Bologna, the capital of Emilia region, is presented here through some examples to illustrate the development of this art form over a period of over the past seven hundred years. 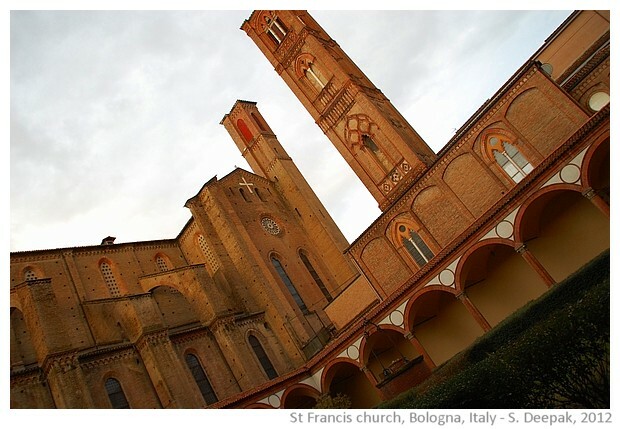 The St Francis church built in 1236 is the first example of Gothic architecture in Bologna. This church was also the site where students of arts and rights at the Bologna university set-up in the 11th century, used to meet. From those days, the church has tombs of many illustrous university teachers. 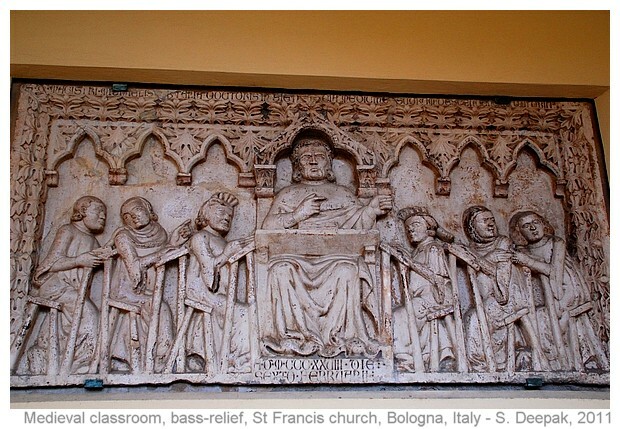 The church has many bass relief sculptures on the tombs of the teachers, showing the university life in medieval Bologna. One of my favourite bass-relief sculptures from St Francis basilica church is on the south-west wall of its inner courtyard surrounded by a simple portico. It shows a teacher explaining in the class, while a few students are studying, a couple are talking and one is playing. The 14th century bass-relief brings alive a class room of seven hundred years ago and it is remarkably similar to some present day classrooms. 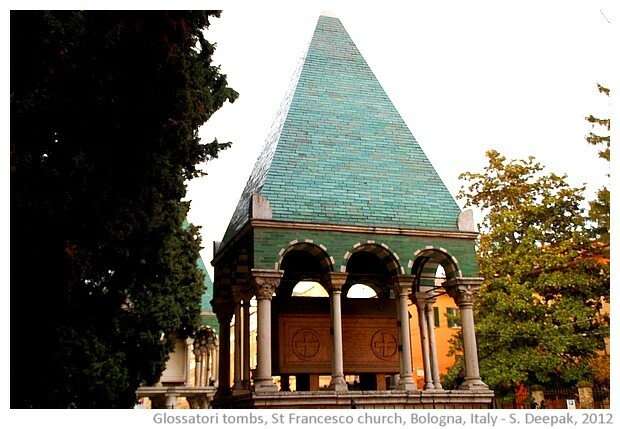 Another distinctive feature of this church are "glossatori tombs", of the professors of language (literally "glossatori"means those who work with words, and is the origin of words like glossary). These brick and terracotta tombs have conical constructions on the top covered by smooth, green coloured ceramics. Inside, this church has the tomb of the pope Alexander V from 1482 made in terracotta. During the reign of Napoleon in Bologna around 1796, the church was turned into a custom house. So if you are visiting Bologna, do not forget to visit this unassuming looking church. Over the next two hundred years, as the artists started experimenting with individual statues, one very interesting group of terracotta sculptures were made by a sculptor called Niccolò. 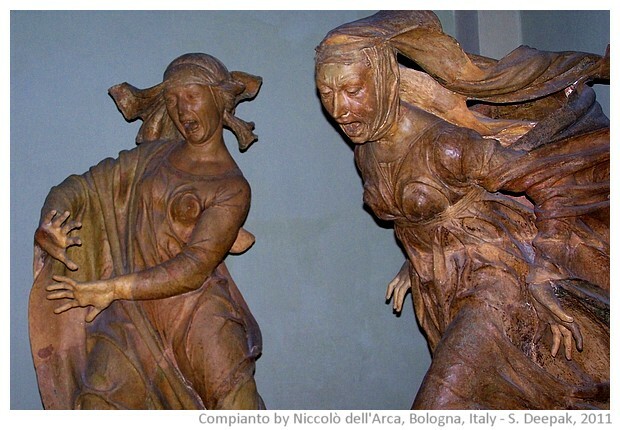 The sculptor Niccolò da Bari, born in 1435 came to Bologna from south of Italy. He became famous as "Niccolò dell'Arca" after creating the famous arch for the tomb of St Dominique in Bologna. Some time between 1465 and 1490, he created a group of 7 terracotta statues, including the dead Jesus and a group of persons crying around him. The statues are larger than life size. The sculptures of Niccolò dell'Arca are masterpieces of human expression, especially the statues of the two women, Mary and Mary Magdalene. The two women are shown with their mouths open in an eternal shriek, their faces screwed up in sorrow, their clothes flying behind. It seems difficult to believe that these two statues are made of terracotta, they look as if actual persons were turned into clay suddenly, their bodies frozen in eternity. 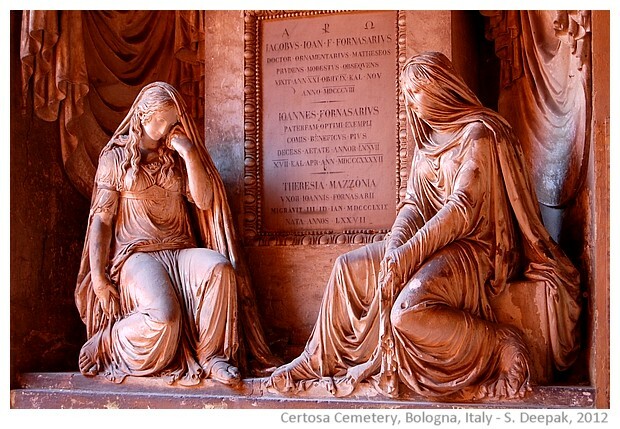 These extremely dramatic statues of the two women expressing their grief are very uncommon in the Italian art from that period. 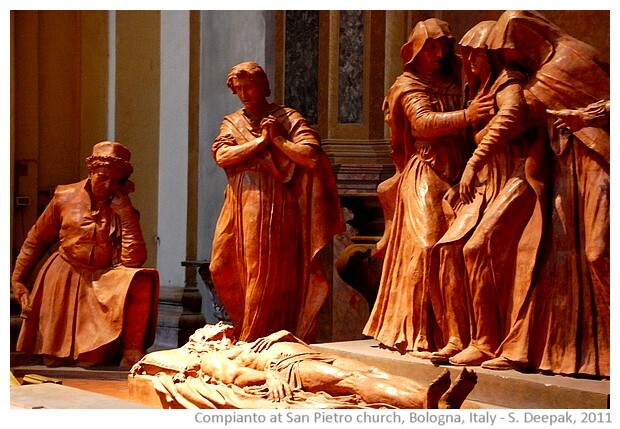 Usually, the grief around the dead body of Jesus is shown through sad but composed faces, as you can see from another group of terracotta statues showing the same scene, at St Peter's church of Bologna. Compare the expressions of the women in this second group of terracotta statues with those of the Niccolò dell'Arca's statues above and you will understand why Niccolò is considered special. 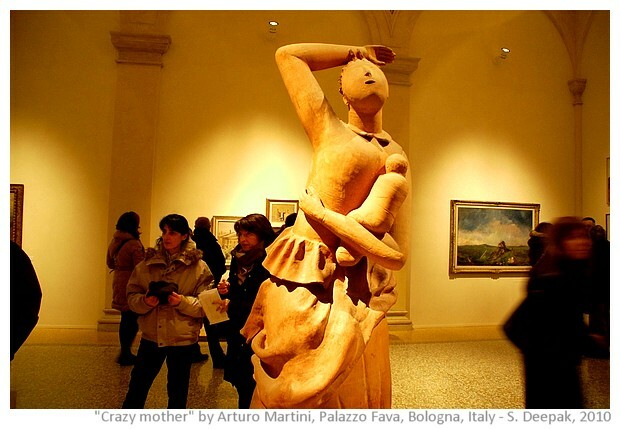 Arturo Martini (1889-1947) was born in Treviso and made some interesting sculptures with terracotta during 1928-32 such as the "Crazy mother". He studied in Munich and Paris, and was influenced by the futuristic movement. His terracotta work shows the evolution from the dramatic realism of Niccolò dell'Arca to a more abstract representation of human emotions. Villa Spada is a noble family house from fifteenth century in Bologna, that has some wonderful Italian gardens, with plants cut into geometric shapes. The villa was renovated in 1980s and was converted into a textile museum. 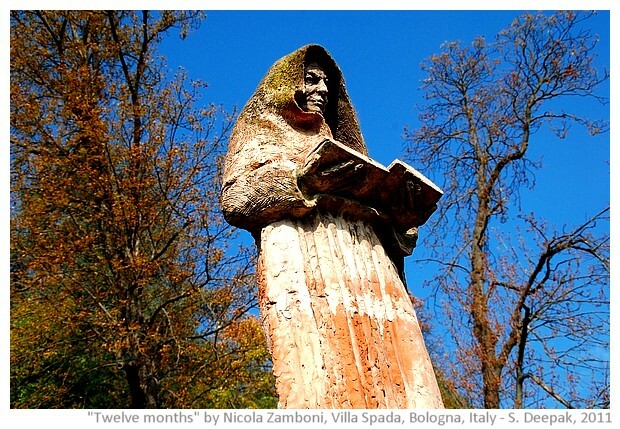 Nicola Zamboni, a contemporary sculptor from Bologna, was asked to create a set of statues for its gardens. Zamboni born in 1943, worked with famous British sculptor Henry Moore in the 1970s. Since then he has evolved his own distinctive style of art. He works with different materials including wood and bronze. 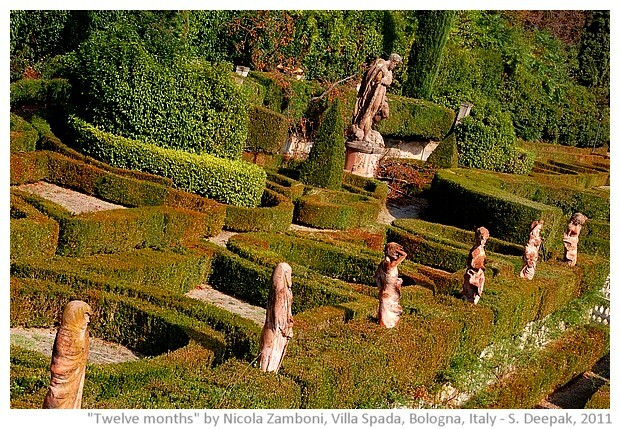 However, the group of terracotta statues that he has created for the gardens of Villa Spada, are my personal favourite. Zamboni explained to me, "After I came back from my stay with Henry Moore, I was very much influenced by his way of sculpture. For many decades I worked with contemporary sculptures. However over the past couple of decades, I have rediscovered a connection to more classical sculptures." 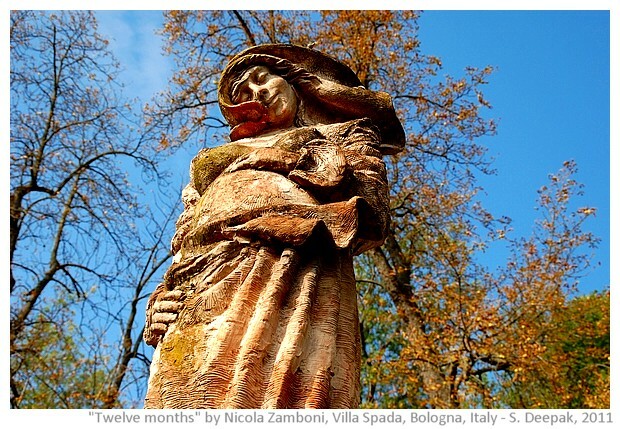 The terracotta statues of Villa Spada are called "Twelve months" and show women of different ages. These terracotta sculptures are in classical style. The twelve women standing in a row in the geometrical gardens with the background of gently rolling hills, evoke feelings of tenderness and beauty. For example, the ninth month, September, is represented by a pregnant woman, holding her hand on her tummy, lost in day-dreams of her unborn baby. 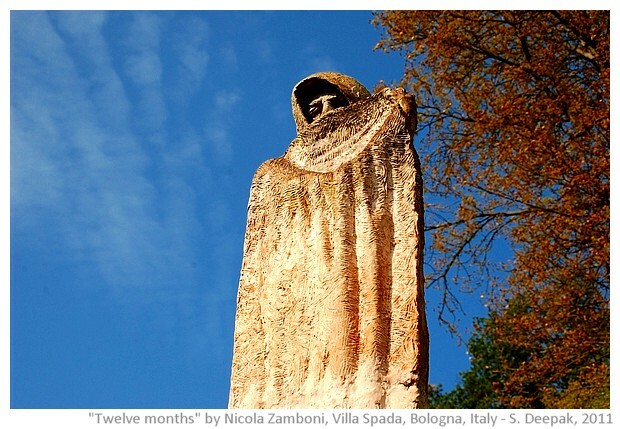 Though these sculptures were made in 1997, their style is in line with the fifteenth century building of Villa Spada. These statues are a testimony to the continuing tradition of terracotta sculptures in Emilia region of Italy. 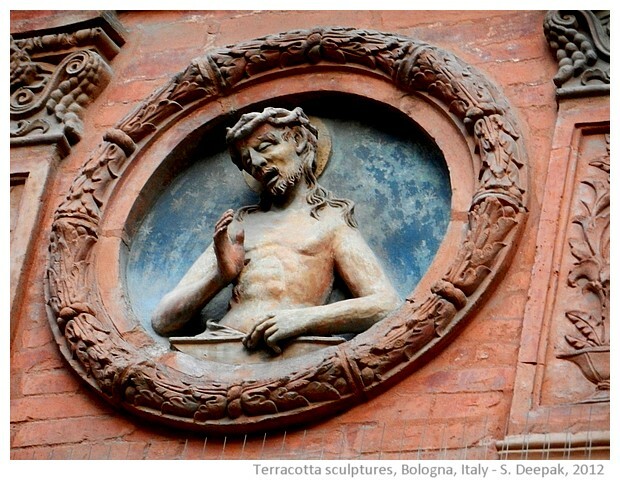 Bologna is full of terracotta sculptures. 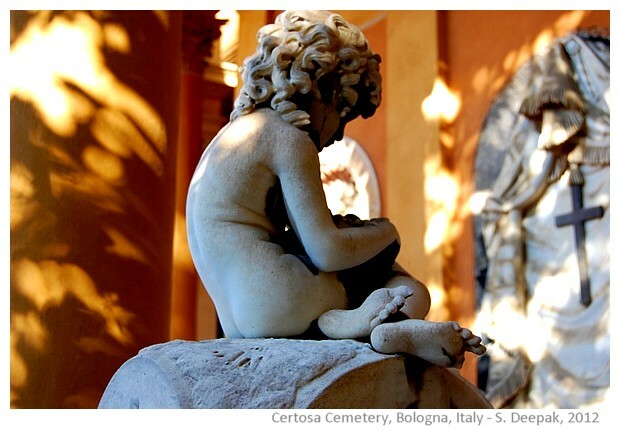 A useful starting place to see some of the most beautiful sculptures from different periods is at the Certosa cemetery in the south of the city. 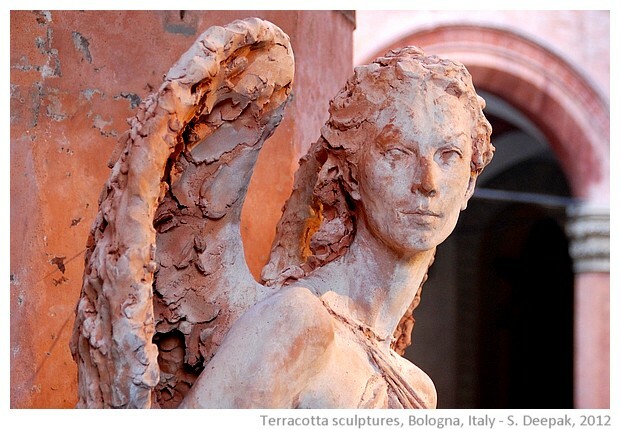 Bologna also has frequent exhibitions and presentations of terracotta statues. Here are some examples from the central square of Piazza Maggiore in the city centre. Terracotta sculptures go back to prehistoric times. The availability of clay suitable for making terracotta sculptures led to the development of a tradition of making terracotta sculptures in Emilia region of Italy especially since the arrival of Gothic style of architecture around 1200s. This tradition saw achievement of great excellence in expressing human emotions through sculptures such as the works of master artists like Niccolò dell'Arca in fifteenth century. Six centuries later, contemporary artists like Nicola Zamboni continue that tradition of excellence in terracotta sculptures. I love the terracotta sculptures. I hope that through this article, you will share some of my love for this art form.